The Peace dollar is one of the most popular USA coin series, since mint state examples are plentiful and relatively inexpensive. In fact, the only coin in this series that is scarce in mint state condition is 1934-S, although 1921 Peace dollars are valued highly for their one-year-only type status, and 1928(P) dollars are desirable because of their unusually low mintage. Other dates carry only modest premiums in lower grades, although these advance somewhat in grades of Extremely Fine and About Uncirculated. Grading obviously worn examples is not difficult, as there are clear illustrations and text in The Official American Numismatic Association Grading Standards for United States Coins. The real problem lies in distinguishing very lightly circulated Peace dollars from those that truly are mint state. Perhaps no other series has such a high percentage of specimens that are almost, but not quite, uncirculated. These usually were purchased as gifts or for some promotional campaign and often were deposited in banks as quickly as they were received. Since most Americans didn't actually use silver dollars in daily commerce, such revolving traffic was common until the late 1950s, when people first began to consciously save these coins. 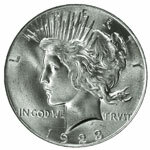 Distinguishing between a mint state Peace dollar and a "slider," or lightly circulated piece, should be fairly simple once one has seen examples of both. Sadly, many collectors who obtain "raw" (uncertified) coins may be buying sliders, not suspecting that they're not the mint state coins advertised. However, purchasing one or more examples certified as mint state by a major grading service will enable one to quickly recognize the slight dulling effect of luster loss typical of sliders. Once it has been established that a Peace dollar is indeed uncirculated, the challenge of assigning a numerical grade from 60 to 70 remains. The vast majority of mint state examples fall within the range of MS-60 to MS-62. This is not reflected in the certified population data, as such low-end coins usually are not worth submitting for grading and encapsulation. Most collectors prefer Peace dollars that grade at least MS-64. Such coins should have full luster, but they also may have a number of small contact marks and perhaps one or two larger ones. In grades MS-63 and lower, a grading service such as NGC does not weigh their sharpness of strike heavily. A smart buyer can shop around for a specimen that displays the requisite qualities for a particular grade level with the additional bonus of a sharp strike. This will be quite challenging for San Francisco Mint dollars of the 1920s, as these are nearly all softly struck in one or more places (exceptions may be found with some 1922-S and 1926-S dollars). Most coins in this series are available in MS-64, while the common dates are readily obtainable in grades as high as MS-66. Collectors may want to take advantage of this fact when planning a collection of these handsome coins. The major grading services are quite consistent about what qualifies a Peace dollar as MS-65. It must have full luster and minimal contact marks, none of them too obvious. 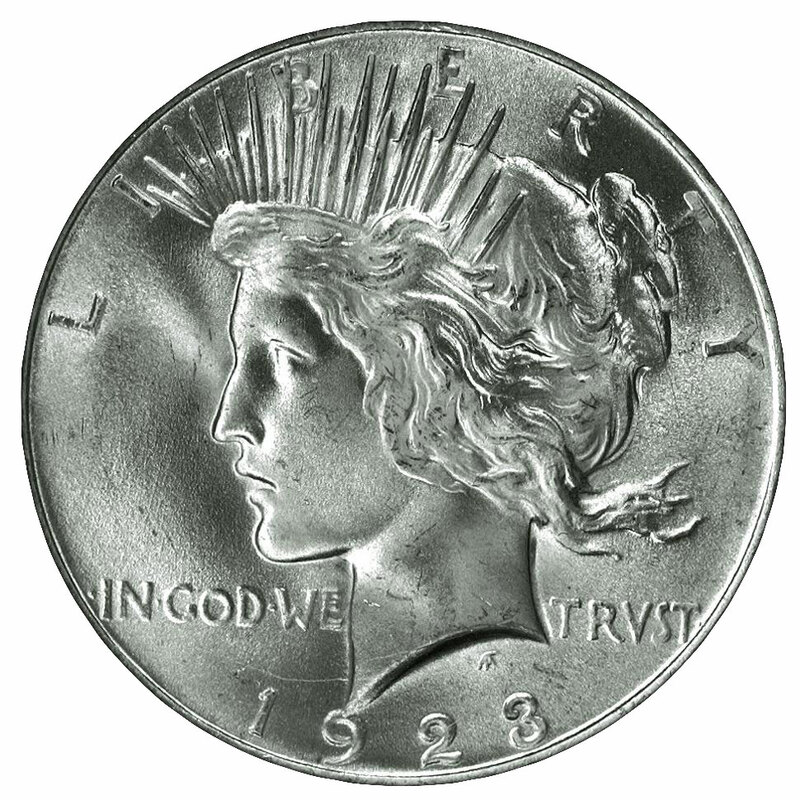 The location of contact marks also is critical, since the Peace dollar's shallow and fairly plain obverse is particularly vulnerable. 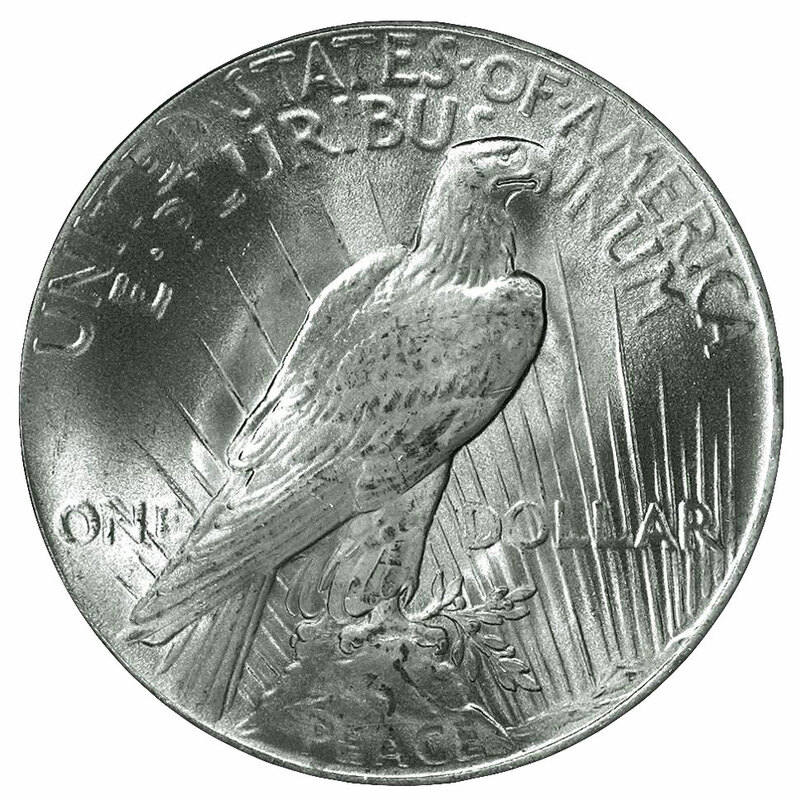 A prominent mark on Liberty's cheek or in the field to either side of her portrait can lead to downgrading, as can a deep mark on the eagle or in the field to its left. Nicks or abrasions through the date also are damaging to a coin's grade. As with most coin types, attractive toning can enhance the Peace dollar's market value, and this is factored into its certified grade. Peace dollars, however, seldom display the attractive, symmetrical toning often seen on Morgan dollars. Instead, they are far more likely to have irregular or blotchy coloration. As mentioned above, a coin's strike is less important than these other factors, though one certified MS-65 or higher should be reasonably well struck.